Radar has been a certified therapy dog for 1½ years. 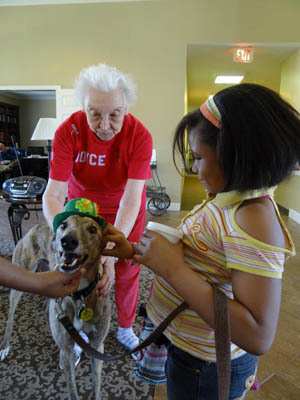 Radar earned his 100 therapy visit certificate and has now surpassed that number by visiting assisted living centers, nursing homes, private homes and working with private reading students. Radar may have flunked out of racing school, but that just meant that he could begin his life's vocation more quickly - therapy dog. He truly loves his work. He is both gentle and enthusiastic as well as sensitive to client needs. Radar entertains his clients with a variety of "tricks" including "kissing goodbye." Radar also paints; however, rather than selling any of his items privately, his works are exclusively donated to causes which benefit animals. He continues to take classes, and just completed a "colors, shapes and sizes recognition" class. There is nothing quite like the sound of people laughing and giggling and sighing with delight while stroking Radar. Working as a therapy dog appears to bring joy to Radar, his clients and his family alike.